Fava Beans: Warning— There is a rare genetic deficiency that affects some people and can lead to health problems if they eat fava beans. This condition is relatively rare and usually detected by childhood, but if you have never eaten fava beans before we recommend you check out www.g6pd.org to learn more. Potatoes, Yukon Gold: Your Yukon Gold’s this week are young with tender skins. You may notice the potatoes are unwashed, and that is because we didn’t want to further peel their delicate young skins. Also, make sure to keep them refrigerated as they have not yet developed a thick and protective skin. 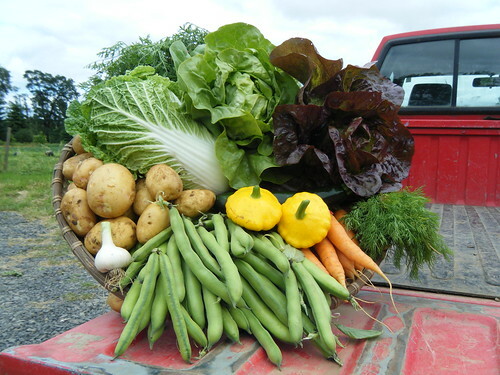 In addition to the crops SIO grows for our CSA program, we also grown and sell produce to 30-40 Portland area restaurants and kitchens, and this season at SIO we are partnering with some of those restaurants for some culinary inspiration. We have been picking the brains of some of the areas most talented chefs and restaurant owners, and have asked them to provide us with recipes and general cooking techniques based on the crops that you receive in your shares. Out at the farm we crop plan separately for both our CSA program and restaurant sales, so you don’t have to worry that part of your share may be going to the restaurant down the street. The recipes that the chefs will feature include a variety of vegetables that you will see in your shares throughout the month, so remember to look back at the Chef’s Corner weekly. For the month of July our featured Chef is David Anderson of both Genoa & Accanto, on SE Belmont in Portland’s Sunnyside neighborhood. David Anderson, 32, is the Executive Chef of not one, but two, critically praised restaurants – the elegant prix fixe classic, Genoa, as well as the Italian café Accanto, its more relaxed next door sibling. David came to Portland from Ketchikan, Alaska in 2000 and worked his way up through some of this city’s finest kitchens –including Café Azul, Southpark, Lauro and Vindalho. From the beginning, he has been recognized as one of Portland’s best young chefs, with Willamette Week honoring his work as Chef de Cuisine at Lauro Kitchen by naming it “Restaurant of the Year” in 2004. Moving on to Vindalho in 2005 he was featured in Gourmet Magazine, the New York Times and the Wall Street Journal. His commitment to the culinary arts also garnered accolades from the Oregonian’s Diner Issue in 2007, where he was called out as one of Portland’s “Rising Stars”. In 2008, David was crowned as the champion of “Iron Chef Portland”. David’s second decade in Portland promises to be just as exciting. In addition to the reinvention of Genoa, one of Portland’s most significant culinary icons, perhaps his most significant achievement has been the commitment to highlighting the work of our community’snumerous charitable foundations. David credits his first Share Our Strength’s “Taste of the Nation” nine years ago, for introducing him to the power of food-related philanthropic events. Under his stewardship, Genoa and Accanto have been involved in well over three dozen charity events, raising money and awareness for local and national organizations addressing issues such as; hunger, healthcare, homelessness, HIV/AIDS, and education for our community’s disenfranchised youth. Chances are that if you’ve dined at either Genoa or Accanto a percentage of your dining-dollars have gone directly to those in our community in need. 1. In a dry skillet lightly toast the almonds and bread. Remove to a bowl and soak with the milk. Allow to soak for at least a half an hour. 2. In a blender combine the rest of the ingredients except the olive oil. Puree until very smooth slowly drizzling in the oil until emulsified. Add a few cubes of if too thick. 3. Season to taste and chill in the fridge for about an hour. Taste again for seasoning and serve in chilled bowls garnished with the piment or paprika. 2. Add the cooked chard to a food processor along with the ricotta lemon juice and zest and puree. Season to taste and stir in the pine nuts. 3. Blanch the pasta sheets in plenty of salted water one at a time then remove to an ice bath. Toss lightly with oil and set aside in a single layer. 4. Pipe or spoon a line of filling a half an inch above the edge of the pasta sheet and roll up into tubes. Continue until all the filling is used up. Chill for about an hour. 5. Cut the tube of pasta into equal lengths about 4 inches long. 6. Line the cannelloni in a baking dish. Pour the cream over the cannelloni and top with the grated parmesan. Bake in a 400 degree oven until bubbling and hot all the way through. Serve immediately. 1. Boil the potatoes in their skin until tender. Drain and cool. Half or quarter and set aside. 2. In a dry skillet lightly toast the coriander and cumin. Cool slightly and grind. Combine with the turmeric and cayenne. 3. Heat the oil in a wide skillet. Add the cinnamon, clove and peppercorns and lightly fry for a few seconds. Add the potatoes, beans and summer squash and sautÈ for a few minutes until lightly colored. Add the cabbage, onion, garlic and ginger and sautÈ for a few more minutes until softened. 4. Add the spices and chopped tomatoes and bring to a simmer. Turn the heat down and simmer for about a half an hour. 5. Stir in the yogurt and season with salt and pepper. Serve hot with basmati rice. 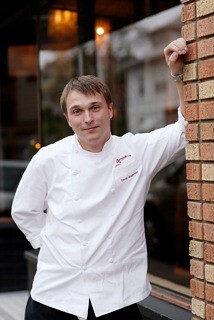 If you have any questions about the recipes David has offered his e-mail contact: david@genoarestaurant.com. Put the stock/broth in a medium saucepan and bring to a boil. Add the carrots. Cover, reduce the heat and simmer for 30 minutes, or until very tender. Transfer to a blender/food processor and puree until smooth. Season with salt and the lemon juice, if using. Makes about 1 cup. Warning: There is a rare genetic deficiency that affects some people and can lead to health problems if they eat fava beans. This condition is relatively rare and usually detected by childhood, but if you have never eaten fava beans before we recommend you check out www.g6pd.org to learn more. Season the raw bean pods generously with salt and toss with extra virgin olive oil. Place the pods on the grill and cook until blackened and soft. As the pods pop and blister on the outside, they steam within. When they have sufficiently charred on both sides, remove the pods from the grill, let cool, and then pry them open to reveal the beans, which may be slipped from their thin skins or eaten whole, skin and all. The salty, meaty beans are as tasty as they are easy to prepare. Shell and prepare the fava beans. You only need to shell them from the pod and you can leave the outer layer on the beans because it will be blended into a paste in a food processor. Collect all ingredients with the exception of the beans, and mince to a fine paste in food processor. Add beans and process to a medium fine paste. Do not over-grind the beans, as they will not hold their shape in the oil if too fine. Refrigerate for about 1 hour to allow the mixture to firm up. Heat 3-4 tablespoons of olive oil in a pan, more if desired, and making small patties with the mixture, fry until the sides are well browned. Serve with pita bread, chopped lettuce, dill dressing (recipe below), and other veggies of your choice for falafel gyros. Combine mayonnaise and sour cream; gradually stir in milk, mixing well. Stir in remaining ingredients. Cover and chill several hours. Use as a dressing for falafel gyros, or to dress salad greens. Makes 2 cups dressing. Note: This recipe can easily be halved for less servings. Prepare and place all the vegetables in a large bowl. Sprinkle olive oil, vinegars, and lemon juice evenly over the top of the vegetables. With a mortar and pestle (or food processor, or other method for griding) grind the coriander and mustard seeds into course powder. Sprinkle the ground spice mixture over the top of the veggies. Sprinkle with salt and freshly ground pepper to taste. Mix well using your bare hands making sure to combine all the ingredients at the bottom of the bowl as well. Taste, and adjust seasoning as desired. Let sit for at least 15 minutes (and up to 24 hours) before serving. Serves 8 as a side. Mix together vinegar, soy sauce, olive oil, sesame oil, ginger, brown sugar, garlic and hot sauce and divide between two shallow pans. Drain and slice the tofu into 1/4 inch slices. Place slices in one pan of marinade, making sure all sides are covered with liquid. Slice up the vegetables. Add all the vegetables to the other pan of marinade, stir to coat and refrigerate (if using potatoes and carrots they should be precooked 5 minutes before adding to the marinade). Marinate both the tofu and vegetables in the refrigerator 8-24 hours; the longer the tofu is in the marinade the more flavorful it will be. Remove the tofu from marinade and fry in a fry-pan over medium heat until lightly browned (the oil in the marinade will prevent sticking without adding more to the pan). Set cooked tofu aside. Drain off excess marinade and cook marinated vegetables by grilling in a non-stick grill pan until crisp-tender, roasting in a single layer at 425˚F until tender, or stir-fry on stovetop. Combine cooked vegetables and tofu and serve. May also serve with brown rice, quinoa, or Asian noodles.